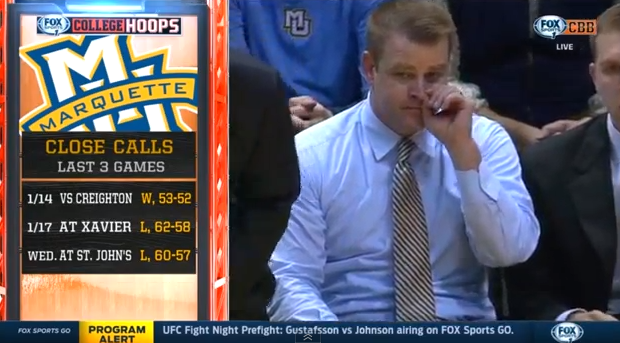 I know, I know, it’s been over 48 hours since the Marquette vs. Georgetown game ended, time to move on. Despite having played in three-consecutive one-possession games prior to Saturday’s thriller, this one was different. There wasn’t a true sense of closure and I keep replaying moments in my mind. I needed to see it all again to digest it, and finally let it go. So I reached out to @FriarTV on Twitter, who provides some sweet highlights and gifs for the Providence games and other Big East action, and who was kind enough to help me out with this request, (and others, like this gif of Josh Smith getting smashed in the face). Go follow him on Twitter. So without further ado, here’s the full video of the last five minutes of regulation and overtime. Here are some thoughts that popped up watching the madness once again. 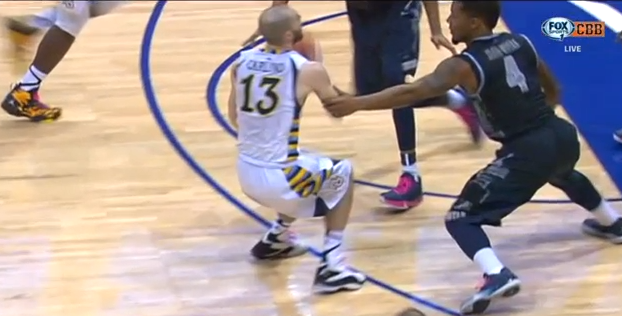 Carlino got full-on gut-checked by Josh Smith at the :28 mark but no whistle. Just because a defender has his hands raised, doesn’t mean he’s not fouling. Carlino gets cut off by Smith who is still moving even after the whistle blows. This would have been Smith’s 4th foul and with over 4 minutes left, completely altered the game. Can’t ask for a better look at the 2:00 mark. Juan took it with confidence (no hesitation) but didn’t come close. Josh Smith with a textbook seal, too. Wojo gets pretty heated at the non-call against Carlino/foul on Derrick, but the refs got it spot on. Duane Wilson really stepped up in the biggest moments, starting with a trey at 4:16 on offense and following that with a strip that turned into a Fischer flush. #DuanesWorld indeed. And then he steps out of bounds. Momentum killed. The sequence at 8:49 is a killer. Perfect defense for 35 seconds, a decent box out from Juan, but Josh Smith simply uses his strength to rip the ball away and get fouled. Duane missing free throws in clutch time rare. Really rare. Missing the front end of a 1-and-1 down by one. Ouch. Having the Hoyas come back and score on the other end after nearly stealing it. Even more ouch. Duane. Onions. 14:43. But one thing to really applaud is Wojo wasn’t afraid to call a timeout 10 seconds after calling one when the initial play he drew up (the same one they ran against Creighton in crunch time to Carlino) went nowhere. Easy call against Fischer, and a product of a great entry pass leading Smith to his strong hand and away from the defender. A simple pass can go a long way. You know what’s next but here are my questions. Where was this angle on Carlino’s shot? 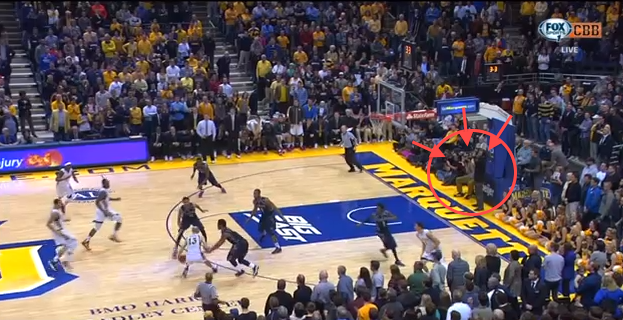 There were 5.9 seconds left when MU inbounded the ball, and that was coming off of a sub. Plenty of time to get the camera in position. What were these guys doing and why did we never see what they saw? I guess grabbing the arm of a shooter is cool as long as it’s coming in crunch time. Having said all that, it’s completely possible and more than likely that Carlino’s toe overstepped its boundary and it was a 2, not a 3. I just don’t get why there was only one video shot available. Even if they don’t clear anything up, show that. Instead we are treated to the same loop of inconclusive nothingness for 4 minutes. 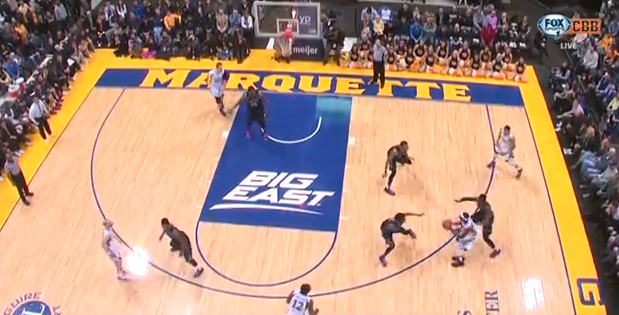 Overtime was another animal where Marquette couldn’t capitalize on the penetration it was getting, and just didn’t have enough defensively without Fischer. The OT is/was surprisingly easier to swallow in comparison to the last five minutes. A few inches here and there would have made all the difference.